Coverage: Live on BBC One & BBC Sport website and app; Listen on BBC Radio Scotland; live text commentary on BBC Sport website and app. Scotland centre Mark Bennett is set to miss their final Six Nations match against Italy with six other players being assessed for injuries. Bennett came on for Stuart Hogg after 17 minutes of the 61-21 rout by England, but was taken off four minutes later with knee and arm injuries. Full-back Hogg, wing Tommy Seymour and number eight Ryan Wilson are being treated for concussion. Finn Russell, Huw Jones and Richie Gray also require precautionary scans. 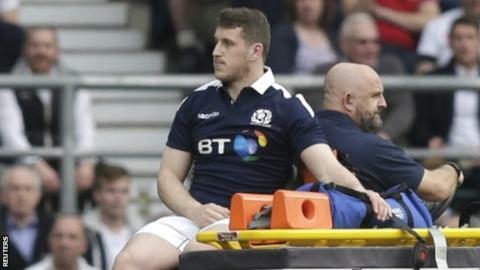 Fly-half Russell and centre Jones, who scored two of Scotland's three tries at Twickenham, both have knee injuries, while lock Gray has a hamstring issue. Scottish Rugby reported that Bennett, who will move from Glasgow to Edinburgh next season, is expected to play no further part in the championship. Hogg, Seymour and Wilson will now be subject to the head injury assessment (HIA) protocols to determine whether they will be involved against Italy. Scotland have already lost captain Greig Laidlaw, number eight Josh Strauss and flanker John Hardie to injury, and have been without first-choice props WP Nel and Al Dickinson for the entire championship. With Bennett ruled out, Jones an injury doubt and Duncan Taylor unable to join up with the squad last week because of a hamstring injury, Gloucester's Matt Scott may come into the selection mix this week. Wing Sean Maitland, who missed the win over Wales with a rib injury but has since returned with his club Saracens, is also likely to be in contention for a place in the match-day 23. Head coach Vern Cotter said when announcing the side to play England that Maitland "is ready and available if we need him." Cotter admitted after Saturday's mauling that his main concern was seeing "if he can get a team together" for the Italy encounter at Murrayfield, which will be his final match in charge. Cotter believes Scotland can still secure a top-half finish in this year's Six Nations if they record a third win in the championship for the first time since 2006.